Following a successful campaign aiming at collecting more than 100,000 signatures, Switzerland will hold national referendum to vote on basic income. On October 4, 2013 activists delivered more than the necessary 100,000 to call for the vote. The organizing committee for the initiative has been collecting signatures for months in preparation for this event. The proposal is for a substantial basic income of 2,500 francs ($2,756US) per month for every adult legal resident of Switzerland. Along with the signatures, supporters held a large demonstration outside the Federal Palace in Bern. 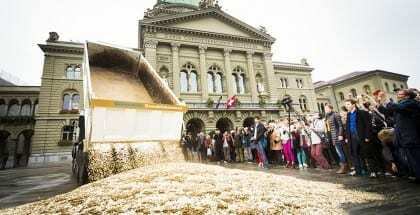 At the demonstration they dropped a dump truck load of 8 million five-rappen coins, one for each person living in Switzerland (see video below). Assuming the signatures are valid, the government is now obliged to schedule a vote in the near future. If you know of other stories on this issue, please leave the full info and link in the comments section. Please note what language the story is in. A tiny transaction fee on wall street derivatives trading would do the same thing for the U.S. Imagine what that would do to stimulate the world economy. If a basic income is introduced in Switzerland and it works out, this could be the start of it being introduced in other European countries.